Showers early, then cloudy in the afternoon. High around 70F. Winds WSW at 10 to 15 mph. Chance of rain 30%.. Variable clouds with showers and scattered thunderstorms. Storms more numerous this evening. Low 44F. Winds WSW at 10 to 20 mph. Chance of rain 60%. BOISE (AP) — A squiggle becomes a full head of white hair. A few curved lines help form a face with some prominent laugh lines and some additional ones turn into an iconic set of glasses, a yellow polka-dot dress and a gray sweater. Yet more lines add depth and character until Lola, the sassy senior citizen who's been making people laugh since the ``Lola'' comic strip was first syndicated in 1999, emerges from the page. The man behind the pen and Lola's witty zingers is Todd Clark, 50, of Boise. In an office with walls crammed full of comic strips from fellow artists, his own work and plenty of Boise State University memorabilia, Clark sketches out Lola, her son Ray, her daughter-in-law Amy, grandson Sammy, boyfriend Harry, best friend Etta and the rest of the characters he developed with former cartooning partner Steve Dickenson. 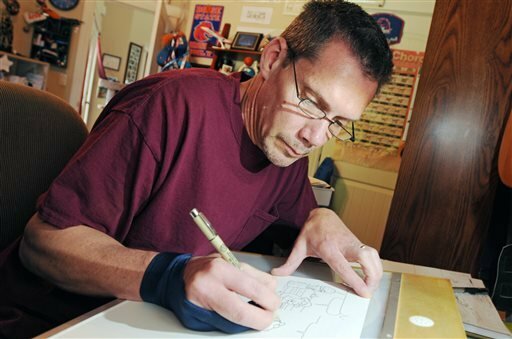 Clark said many cartoonists work on a tablet, but he still takes pen to paper at his drawing board for his daily and Sunday strips. Being able to make people laugh is how Clark broke into the business. He started out writing gags for the authors of other comic strips. Clark said he bought out Dickenson's share of ``Lola'' roughly seven years ago, but the strip will always have a connection to his family. That's because the main character was inspired by Dickenson's great-aunt Lola. Clark met the inspiration for the strip once. Comic strip Lola's personality has expanded over the years. In between offering advice to her grandson and his friends, golfing up a storm and going on dates with her beau, Lola is also quite the crafter, as in an April 2 strip where she was crocheting a holster. That talent has inspired others handy with a crochet hook. Cartooning can be done from anywhere, but Clark said his mother still received a lot of disbelief from people when she told them the ``Lola'' cartoonist lived in the Treasure Valley. The strip, featured daily in the Idaho Press-Tribune, is chockfull of references to the area. 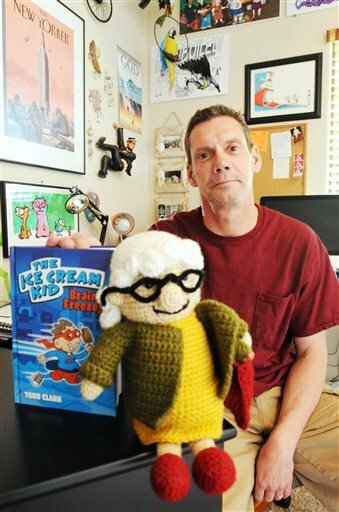 In between all his cartooning and family duties (Clark has two daughters), Clark wrote and illustrated his first children's book: ``The Ice Cream Kid: Brain Freeze!'' The book, out June 3 and aimed at kids ages 7-12, was inspired by what Clark described as a ``weird little thought'' about brain freezes. Some of Irwin's powers include super speed and the ability to talk to animals, which come in handy when he has to battle a villainous lunch lady. In the meantime, Clark will head back to the drawing board to craft Lola's next adventure.